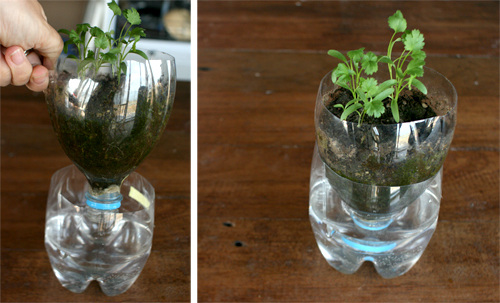 Homemade self watering pots for herbs – it´s working! It´s really cool how this self watering pots truly works. I left them for almost a week without doing anything and when I got back little herbie thingies were peeking out of the muddy thingie… (I need to google translate few words…) The Soil…not mud, right? I put down basil, coriander and mint. How to do this? You can read about it here. yes, that has been my problem, forgetting to water or being away for some days and not being able to water. since watering is very important to those little seeds..